The Nigeria Football Federation (NFF) on Tuesday expressed concern over the burgling of the property of former Nigeria Captain Nwankwo Kanu, with valuables such as medals, plaques and trophies carted away in the heart-breaking infraction. Amongst the items missing is Kanu's gold medal from the men football event of the 1996 Atlanta Olympic Games as well as the medal from the 1993 FIFA Under-17 World Cup in Japan won by Nigeria. These valuables items were carted away from Kanu's Hardley Hotel and Suites in Victoria Island, Lagos, less than a week after the Nigeria legend attended the African Football Awards ceremony in Dakar, Senegal. The property has been a subject of litigation and has been under temporary possession of AMCON since 2015 over alleged indebtedness. "Our superstar and former captain is in intense pain at this period, and we empathise with him. This is tragedy. Losing precious possessions like medals, trophies and plaques can be heart-breaking. "We respectfully call on the Nigeria Police and other security agencies to work hard at unravelling the perpetrators of these nefarious act. Kanu worked very hard from a humble beginning to accumulate whatever he has today and to earn those precious valuables," NFF President, Mr. Amaju Melvin Pinnick, said in Lagos. "Kanu brought immense joy and celebration to many homes across Nigeria, Africa and the world, while playing for the Nigeria U17 team that won the FIFA World Cup, the U23 team that he captained to Olympic gold in Atlanta in 1996 and the Super Eagles for which he featured at three FIFA World Cup finals. "He also served several top clubs in world football, giving them and their fans nothing but immeasurable joy. He has also been spending heavily, through his Kanu Heart Foundation, in getting medical attention for young Africans with heart defects to be cured and live normal lives. "He does not deserve this cruel fate. Our confidence in the Nigeria Police and indeed other security agencies to hunt down these criminals is unshaken. We stand with Kanu at this low moment and we believe he will overcome and put the sad incident behind him soonest," stressed Pinnick. 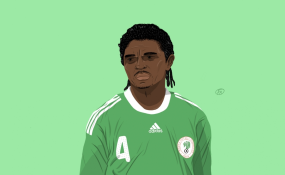 Nwankwo Kanu won the FIFA U17 World Cup with Nigeria in 1993, narrowly missed the Super Eagles' cut for the 1994 FIFA World Cup in the USA but then featured at the 1998, 2002 and 2010 World Cups for Nigeria. He also played for Nigeria at the Africa Cup of Nations between 2000 - 2010, winning one silver and four bronze medals. He captained Nigeria's U23 team to win Africa's first -ever Olympic football gold, in USA in 1996, after which he survived heart surgery. He then played for Inter Milan FC of Italy, Arsenal FC, Portsmouth FC and West Bromwich Albion FC (all in England), winning trophies with the teams.